An atmosphere of fear and aggression reined among the vulnerable illegal migrants, the majority from Africa, sleeping rough on the streets and under the bridges of Paris, RT found while exploring the city’s make-shift immigrant camps. 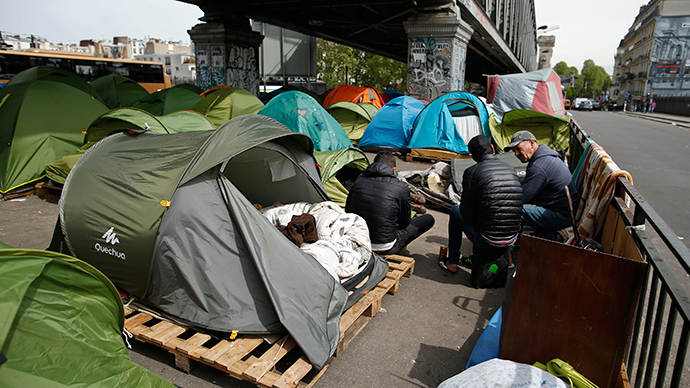 Under the Charles de Gaulle Bridge in central Paris, there are about 500 illegal immigrants, mostly from Africa, sleeping on the streets or in two camps sandwiched between Austerlitz and Gare du Nord railway stations. Some of them have been camping out for days, weeks or even months. Most of them refused to speak to RT’s correspondent Anastasia Churkina due to their vulnerably and illegal status, but a few did. “I come from problem, you know, Darfur?” said one man in broken English. “I don’t have a home, do you know what that’s like?” said another in French. Many of the refugees were trafficked from countries like Libya and had to pay thousands of euros to criminal gangs to get them to Paris. But for many, the French capital is only a transit stop as a lot of them hope to try and make it to the UK, either via Eurostar or by crossing the channel on a ferry. Calais, a channel port in the north of France and the closest crossing point to the UK, has become home to 2,500 migrants. The situation is a headache for the local authorities and locals in Calais. The problems were highlighted last August by rioting between gangs of migrants. Britain and France blame each other for the problem. France says the UK is holding Calais hostage and are washing their hands of the problem, while Britain says France has created the problems in Calais and should sort them out itself. The UK also believes it can’t accommodate any more immigrants, but France argues that the unemployment rate in the UK is half that in France and migrants want to go there because they have a better chance of finding work. Pierre Schweitzer, a political analyst and author, told RT that more effort needs to be put into preventing migrants from leaving their homes in the first place. “Half the problem of illegal immigration comes from Libya at the moment, so we should wonder about our own responsibility in this matter,” he said. One of the reasons so many migrants from Africa and the Middle East are coming to Europe is the result of Europe’s own actions. By supporting the US in interventionist wars, European countries contributed to the destabilization of places such as Libya and Iraq. A report by the Norwegian Refugee Council and the Internal Displacement Monitoring Center released Wednesday found that 11 million people, many of them from Africa and the Middle East, were forced to move within their own countries because of war and conflict in 2014. The UN said last year that, including Internally Displaced People, there are now 50 million people living as refugees globally, the highest number since World War II.